May is Motorcycle Safety Awareness Month across the United States. However, we shouldn’t need to wait for a specific month to start practicing safe driving/riding habits. Whether you’re a four-wheeled vehicle driver or a motorcyclist, you can be doing your part to create safer conditions every time you’re on the road. Here are some tips to help you navigate the roads safely. Wear a DOT-compliant helmet and eye protection. If you’re under the age of 21 (as a rider or passenger), you have to wear a helmet. If you’re over 21, you can go without one—if you’ve completed an applicable motorcycle safety course or you’re adequately covered by insurance. However, just because you can go without one doesn’t mean you should. It’s always better to err on the side of caution. Always assume you’re invisible to other drivers. Too many motorcycle accidents happen as a result of a driver in another vehicle not seeing the motorcyclist nearby. Though it’s their responsibility to be on the lookout, you can do your part to predict their next moves. Pay attention to where other drivers are looking or where their hands are on the wheels, for example. To help make yourself a little more visible, wear bright clothing or reflective stripes when riding. Always be aware of your surroundings. You never know when you’re going to need to make a sudden decision to avoid an accident when riding. Another vehicle could slam on their brakes or make an improper lane change, the road could be much slicker than you expected, an animal could run across the road in front of you, etc… To be prepared for anything that could happen, always have an escape plan. In other words, where will you go or what will you do to avoid a collision? Realize that motorcyclists have the same rights on the road as you do. Yes, they’re smaller than you. Yes, they’re often harder to see. Yes, it can be frustrating when you’re stuck in traffic and they’re able to pass you between lanes. But they have just as much right to be on the road and to be respected as you do. Never change lanes or merge without looking. It only takes a few seconds to check your mirrors and blind spots before changing lanes, making a turn, or merging into traffic. Always use your turn signals. Don’t switch lanes or turn without signaling your intentions to others on the road. Motorcyclists, especially, need to be able to predict your next move. Leave extra space between you and the bike. 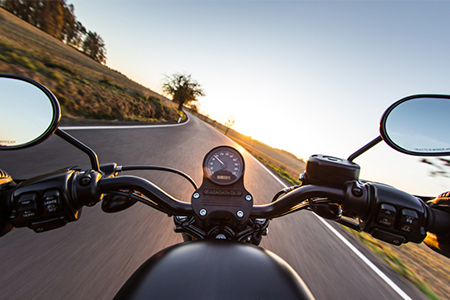 It can be harder to gauge how fast a motorcyclist is going, so if you’re following a motorcycle, always leave a few extra seconds between you and the bike than you would any other vehicle. If you’ve been injured in a motorcycle accident, you need the help of an accident lawyer who is well versed in motorcycle and driving laws and regulations. Contact us to schedule a free consultation or click below to learn more about our legal services.